Review: 2012-05-26, very tough fight but not particularly spectacular: two stars for Semmy Schilt vs Errol Zimmerman 2 (fight ended by TKO in the third round). Semmy Schilt (38-6-1) entered as the No.2 heavyweight in the world while Errol Zimmerman (76-16-1) entered as the No.10. Schilt vs Zimmerman 2, main event of Glory World Series, is valid for the Glory Heavyweight World title; on their first fight Schilt defeated Zimmerman by unanimous decision (April 3, 2010). Watch the video! Review: 2012-03-23, good fight with one knockdown in the second round between Semmy Schilt and Brice Guidon: three stars (fight ended by unanimous decision). Semmy Schilt (37-6-1) entered as the No.2 heavyweight in the world while Brice Guidon (28-6-0) entered as the No.9. 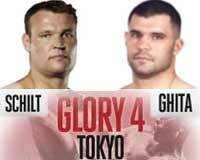 Schilt vs Guidon is the main event of United Glory 15. Watch the video!